When I was a kid, my FAVORITE dinner was always my mom's roast, carrots and potatoes. My mom is so sweet, she even made it for me when I came home from the hospital from having my precious baby Bodhi. I was 37 at the time, and I think it might have just been the most delicious meal I ever ate. Not just because it was REALLY good, and because I had been eating hospital food for three days, but because my mom made it with love...just for me. I hope all my fellow mommies had a WONDERFUL Mother's Day. Here's one for you! Today, I'm making a slight variation from my favorite childhood meal. 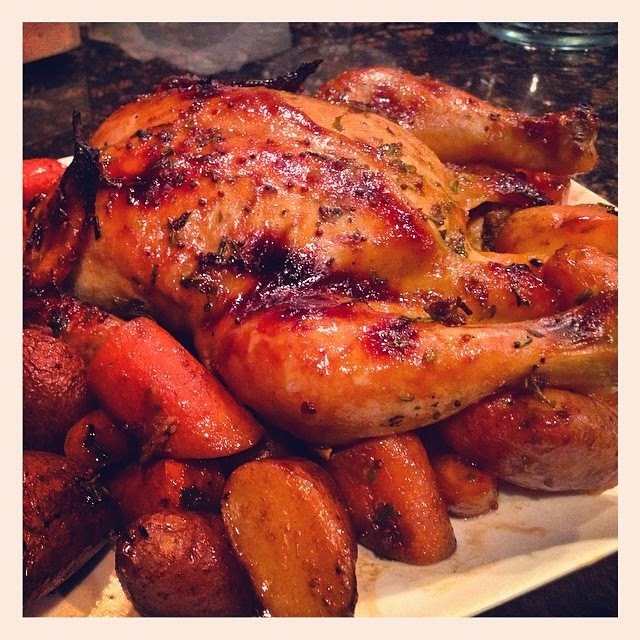 I'm roasting a whole chicken and using Saucy Mama's Honey Dijon dressing for tons of natural, delicious flavor! I added just a bit of garlic, thyme and rosemary, rubbed it all over (and under) the bird; and of course, I threw in the carrots and potatoes as a side. It's easy, healthy, delicious and FUN! Combine the Saucy Mama Honey Dijon Dressing, thyme, rosemary, pressed garlic cloves and lemon zest. Season with salt and pepper to taste. Stir until combined. Prepare the chicken by first removing any giblets from the inside the chicken. Place the chicken in the bottom of a large roasting pan. Using a brush or spoon, spread all of the mixture evenly over both sides of the chicken, working some under the skin of the breast. Add the carrots and potatoes to the roasting pan. Coat the veggies with any of the dressing mixture that spilled over the sides of the chicken. Use a spoon or brush if necessary. Place in the oven at 400 degrees for 30 minutes, uncovered. After 30 minutes, remove the roasting pan from the oven. Some of the dressing will have caramelized on the bottom of the pan. Add the chicken broth to the roasting pan, and deglaze the caramelized dressing with a wooden spoon. Baste the chicken and the veggies with the juices. Return the roasting pan to the oven and continue to cook for another 30 minutes, basting about 15 minutes through. When the internal temperature of the chicken reaches 180 degrees, remove from the heat and allow to cool for 5-10 minutes before carving and serving. on the bird and veggies!